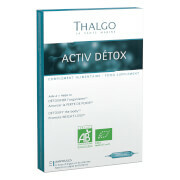 Thalgo Océa Draine is a detox drink that encourages elimination of toxins and waste products, regulates function of the gallbladder, diuretic aids in digestion. Ideal for those who wish to start a slimming diet or cleanse their body because of dietary excesses or a change of season. Organic product: AB label - Ecocert certified, and 100% natural. Drinkable ampoules, easy opening system. Pleasant taste: natural orange flavor. Shake well before opening. Dissolve one vial a day in a glass of water or fruit juice. Repeatable 10-day treatment course. Excellent starter before a slimming diet or a beauty treatment course. Thalgo Océa Draine can be used in conjunction with any other Thalgo nutrition treatment course, being careful not to exceed the maximum iodine amounts used (150 µg per day): one vial = 45 µg.